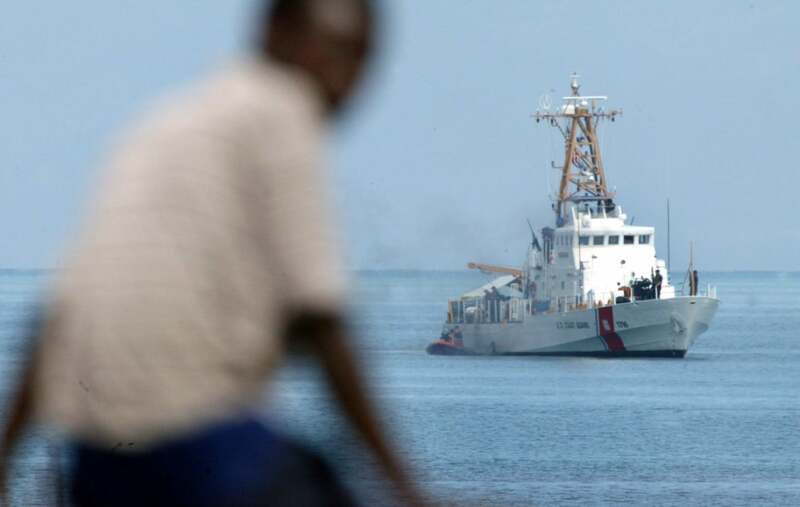 The bodies of 15 Haitian migrants were found after their boat capsized off the Turks and Caicos Islands and four people are still missing, according to the U.S. Coast Guard. The dead have presumably drowned, officials say. The Coast Guard suspended its search for the missing migrants Sunday night after recovering the 15 bodies, who were found floating face down in the water. In addition, 14 survivors were found, The Miami Herald reported. Since 8 a.m. Sunday, the Coast Guard was at the scene, providing search and rescue support to the marine branch of the Royal Turks and Caicos Police. Police were notified that the twin-engine outboard boat with the Haitians onboard, had capsized off West Caicos, which is an uninhabited island. The recovery efforts were set to presume again at dawn on Monday, according to police. Botting told reporters it was unclear how many Haitians were on board the boat. He added that the police would continue its investigation into the cause of the vessel overturning. This is the second time this year that law enforcement authorities have responded to a capsized boat with Haitian migrants. In February, 28 Haitians were recovered by Bahamian police after a boat they were passengers in sank off the northern tip of the Bahamas. In that incident, 17 people were rescued and detained by police. That incident prompted the U.S. Embassy in Port-au-Prince to kick start a public service announcement to educate Haitians on the perils of attempting these types of escapes. But Haitians that attempt to flee deem the country’s bleak economic and political realties far worse than the treacherous risk they face over shark-infested waters and a chance at freedom and safety miles away. The prime minister of Haiti was fired recently by the lower chamber of Deputies, and Haitian citizens face crippling inflation that is higher than it has been in 11 years.